The strike leaders and the worker we picked as MC arrived first at Harry Bridges plaza across from the iconic San Francisco Ferry Building. It was pretty empty. For almost everyone at Google, this was their first strike. No one knew if we were all going to get fired. The farthest office was a 10-minute walk to the plaza, so the crowd gathered slowly at first. One office after another began crossing the streets and arriving. We began to think we might get a hundred or more workers to show up, but soon the plaza was completely filled with over a thousand Google workers. In a new manifestation of the #MeToo movement, Google offices worldwide went out on a rolling strike Thursday, November 1 at 11:10am locally. 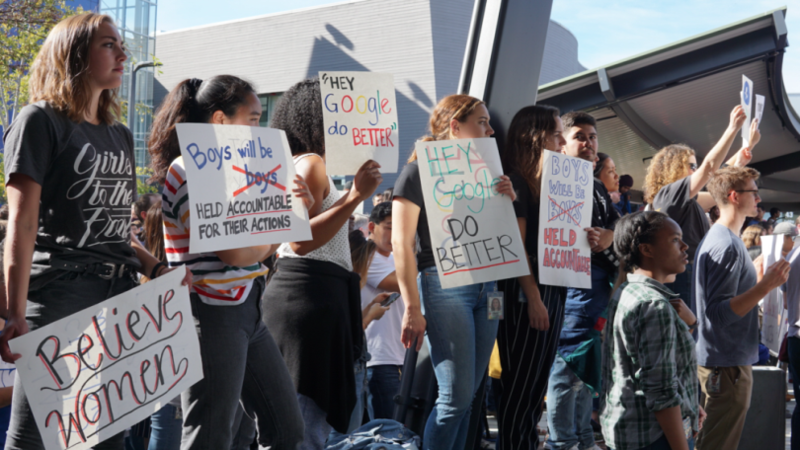 From Singapore to Dublin and San Francisco, some 20,000 Google workers attended strike rallies protesting sexual harassment. We closed down, or partially closed down, 50 offices around the globe. It was impressive and inspiring to see so many Googlers around the globe participate in this action, despite not knowing how Google would respond, or if the bosses would retaliate. The leaders in San Francisco were six women, mostly women of color, and two men. Every woman had a story of sexual harassment or assault from men at Google, and in most cases the harasser was still employed at Google. Many assaulters were promoted or retired with a fat severance deal. The internal Google-workers-only website that national organizers set up to encourage workers to strike was visited by 35,000 out of 94,000 Google full-time employees. Locally, while putting fliers up in my office, one woman walked up to me and asked to help. So off we went, office-to-office, putting up fliers in the other Google workplaces in downtown San Francisco. The strike rally kicked off at about 11:30 am. Our MC spoke about the experience she has had as a woman of color, and the culture of cover-ups for sexual harassment and assault that are unfortunately all too common in the workplace. Another worker got up and explained that this plaza was the place where the 1934 San Francisco longshoremen-led general strike was launched. A woman worker then read out four stories of different women who were sexually harassed while working at Google. Each woman had attempted to pursue a case against their assailant, and each was not taken seriously by HR and Google management. Again in the majority of these cases, the assailants are still employed by Google. The rally, inclusive of both women and men, ended after the speeches, with most everyone going back to work. But everyone was changed by this experience. Many co-workers approached me to thank me for my role in the strike. There is a mood of elation that we made a stand, that we united, and that we went on our first ever strike. Discussions have now been pushed forward into issues like: “what do we do next? How do we win our demands? What will management do?” A small number of workers are opening the conversation about forming a union. I think this is just the start of Google workers beginning to organize – and what an incredible beginning.